Photos via Brianna OlivasExploding smartphones have garnered increased attention since Samsung's Galaxy Note 7 was plagued with widespread reports of exploding devices, prompting an "unprecedented" recall of the popular device. Lithium-ion batteries are more prone to malfunctioning and exploding when manufacturers and suppliers don't take proper care in preparing the batteries for use. For example, Samsung blames the Note 7's battery problems on a flaw that caused two incompatible parts of the battery came together. Uhh..../S stands for sarcasm, which I used after my post. I was being sarcastic. Welcome to the internet. It's one phone. Many things could have caused this. No one was injured. Apple is investigating it. I don't know all the details, but I have a feeling that it's fake. "Dude what the ****... are you ****ing serious right now.. oh hell...."
The article title seems a bit misleading. 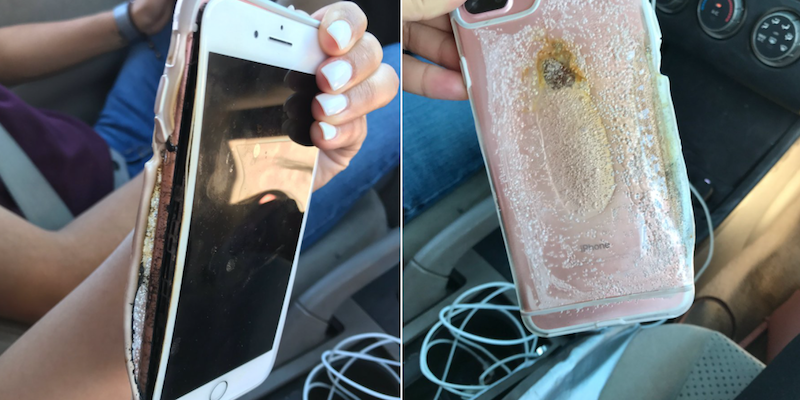 The iPhone isn't melting, the case around it is. $10 says it's an aftermarket battery or cable that didn't stop charging.